The anime-ish artworks that sometimes appear in giant billboards in EDSA have got to be some of the more attractive marketing collaterals I’ve seen plastered on such medium. 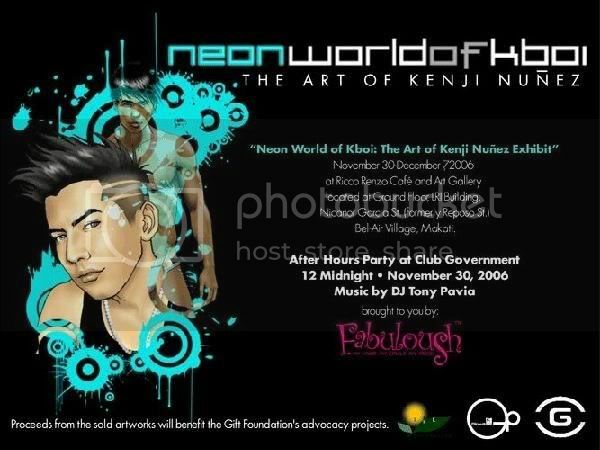 I find out that the man behind these, GP Magazine editor-in-chief and creative director Kenji Nunez, will mount his coming out exhibit “Neon World of KBoi: The Art of Kenji Nunez” on 30 November to 07 December 2006 at the Ricci Renzo Café and Art Gallery at the at the ground floor LRI Building, Nicanor Garcia St. (formerly Reposo St.) Bel-Air Village, Makati City. Nunez’s artworks have debuted in magazines, print ads, internet sites, and, as I’ve mentioned, huge billboards. The 30 artworks that will be on exhibit feature Nunez’s “interpretation of the pink community.” And for the die-hard art collectors, the artworks will be on sale, proceeds of which will benefit the Gift Foundation which promotes AIDS awareness and prevention. I know a friend who worked for GP before and they say this guy is good. Definitely worth a visit.